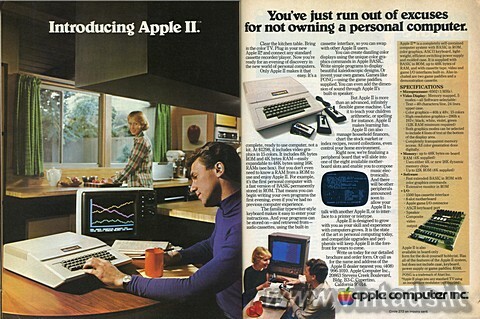 Testo originale: Introducing Apple II. You’ve just run out of excuses for not owning a personal computer. Clear the kitchen table. Bring in the color TV. Plug in your new Apple II* and connect any standard cassette recorder/player. Now you're ready for an evening of discovery in the new world of personal computers. Only Apple II makes it that easy. It's a complete, ready to use computer, not a kit. At $1298, it includes video graphics in 15 colors. It includes 8K bytes ROM and 4K bytes RAM—easily expandable to 48K bytes using 16K RAMs (see box). But you don't even need to know a RAM from a ROM to use and enjoy Apple II. For example, is the first personal computer with a fast version of BASIC permanently stored in ROM. That means you can begin writing your own programs the first evening, even if you've had no previous computer experience. The familiar typewriter-style keyboard makes it easy to enter your instructions. And your programs can be stored on—and retrieved from-audio cassettes, using the built-in cassette interface, so you can swap with other Apple II users. You can create dazzling color displays using the unique color graphics commands in Apple BASIC. Write simple programs to display beautiful kaleidoscopic designs. Or invent your own games. Games like PONG—using the game paddles supplied. You can even add the dimension of sound through Apple II's built-in speaker. But Apple II is more than an advanced, infinitely flexible game machine. Use it to teach your children arithmetic, or spelling for instance. Apple II makes learning fun. Apple II can also manage household finances, chart the stock market or index recipes, record collections, even control your home environment. Right now, we're finalizing a peripheral board that will slide into one of the eight available motherboard slots and enable you to compose music electronically. And there will be other peripherals announced soon to allow your Apple II to talk with another Apple II, or to interface to a printer or teletype. Apple II is designed to grow with you as your skill and experience with computers grows. It is the state of the art in personal computing today, and compatible upgrades and peripherals will keep Apple II in the forefront for years to come. Write us today for our detailed brochure and order form. Or call us for the name and address of the Apple II dealer nearest you. (408) 996-1010. Apple Computer Inc., 20863 Stevens Creek Boulevard, Bldg. B3-C, Cupertino, California 95014. Apple II is a completely self-contained computer system with BASIC in ROM, color graphics, ASCII keyboard, lightweight, efficient switching power supply and molded case. 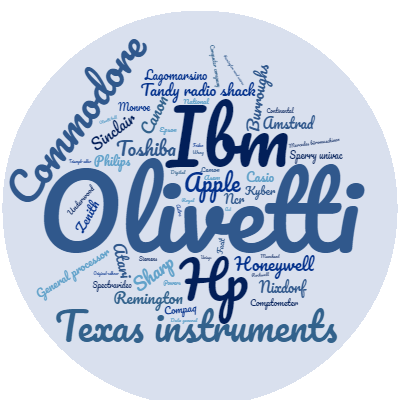 It is supplied with BASIC in ROM, up to 48K bytes of RAM, and with cassette tape, video and game I/O interfaces built-in. Also included are two game paddles and a demonstration cassette. •	Microprocessor: 6502 (1 MHz). •	Video Display: Memory mapped, 5 modes—all Software-selectable: • Text-40 characters/line, 24 lines upper case. •	Color graphics-40h x 48v, 15 colors • High-resolution graphics-280h x 192v; black, white, violet, green (12K RAM minimum required) • Both graphics modes can be selected to include 4 lines of text at the bottom of the display area. • Completely transparent memory access. All color generation done digitally. Apple II is also available in board-only form for the do-it-yourself hobbyist. Has all of the features of the Apple II system, but does not include case, keyboard, power supply or game paddles. $598. PONG is a trademark of Atari Inc.
*Apple II plugs into any standard TV using an inexpensive modulator (not supplied).